“How much time is left?” is a universal question asked by people from every walk of life. Elapsed time is an abstract concept that is difficult to understand and even harder to manage. The innovative TIME TIMER constantly reinforces the sense of elapsed time while promoting better time management. You see time elapse as the TIME TIMER's dial graphically shows how much time is left. How does the TIME TIMER work? Simply move the red disk counterclockwise to the desired time interval. The disk diminishes as the time elapses until no red is visible on the timer. The TIME TIMER relies on visual recognition only — there is no audible signal to mark the completion of a set interval. Requires 1 x AA battery (not supplied). Supplied with a base for free standing operation, or it may be wall hung. 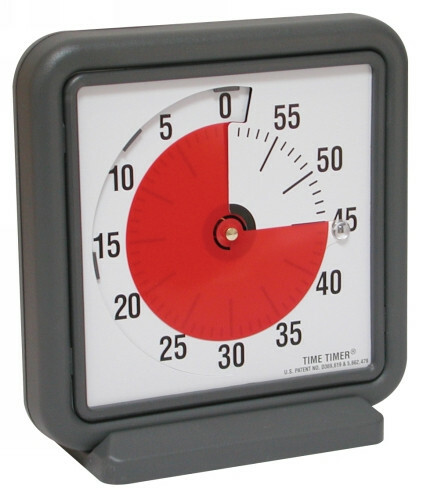 "We use these timers in all our classrooms from 7 - 12. They are great during assessments, time till pack up and for students who struggle with time management and need tasks broken down with time frames. They are a great size and can be hung from the wall as well."